The WeatherTech Soaker is a reusable drying chamois that quickly dries your vehicle without leaving any streaks or lint behind. The Soaker’s 17" x 27" size helps cover more surface area for drying. One side of the Soaker features a smooth surface and the other textured for those that are working with different drying surfaces and techniques. 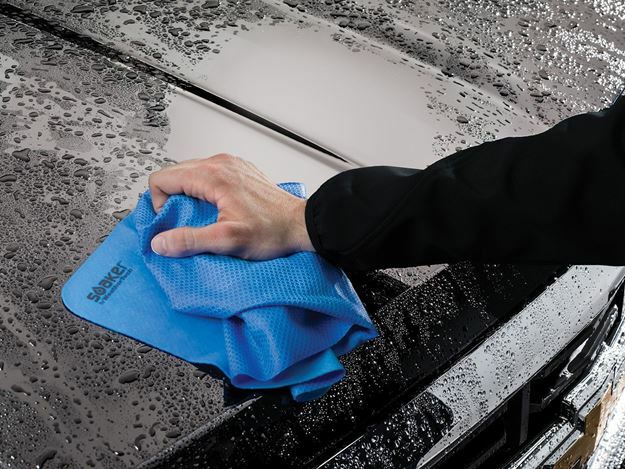 The towel is great for use in the garage, around the house or even after a pet's bath. The Soaker comes with a high impact, premium polycarbonate storage box to help preserve and protect when not in use. Machine washable for long-lasting use. Tooling for the Storage Box was designed, engineered and manufactured in the USA. Prior to using the Soaker, the product must be rinsed in warm water or in a washing machine using liquid detergent. Do not use fabric softener, bleach or dry in a dryer. Immediately remove the Soaker when it's damp and proceed with using the product or place it back into its container. Do not allow the Soaker to air dry. If the product is allowed to completely dry, allow it to soak in warm water until it has regained its soft texture. Make sure to not open the Soaker until it has been rehydrated. When finished using the Soaker, rinse well with warm water, wring out (make sure it’s still damp), then store it in the Soaker box container.